Today, on the 21st anniversary of Eleanor Hibbert’s death, we take a closer look at the book she was supposedly in the midst of writing–and may have even passed without finishing. This is the story of a mother and daughter living in the volatile times of the late 17th century in England. Sarah had a puritan upbringing during Oliver Cromwell’s decade of governance, and when Charles II takes the throne she is introduced to an actress who is visiting the manor where her parents are employed. One small role leads her London, and eventually she is installed at Drury Lane. There she meets Lord Rosslyn, who deceives her into giving up her virtue. Kate is raised by her mother, but eventually travels to her father’s ancestral home in Somerset, where she discovers many things about the man who had always been as a stranger to her. Weaving in and out of the storyline is the political unrest brewing in the country due to religion and the succession. Upon the Duke of Monmouth’s uprising, the events extend a blow to Kate’s personal circle of family and friends. This 13 chapter, 308 page book is the final book produced under the pseudonym Philippa Carr and one of three posthumously published, the others being The Rose Without a Thorn (changed from Kisses of Death) by Jean Plaidy, 1993 and The Black Opal by Victoria Holt, 1993. I have read Plaidy’s novel on Katherine Howard and believe it to be entirely written by the author. Daughters of England, on the other hand, has given me some doubts. The first thing that struck me is that this book, marketed as the 20th in a series, has broken the flow in both characters and setting. 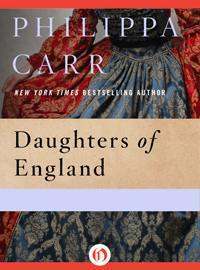 The first Carr—Miracle at St. Bruno’s—is set in Reformation England and lends its characters’ descendants to each book after. Each book presents a new generation, set around the great events that end with the 19th book—We’ll Meet Again—during WWII. Why, then, does the presumably next in the series travel back to Restoration England with completely unattached characters? The next thing I noticed is the title is off and seems to have no meaning to the story. Any Plaidy fan will know that her titles were chosen with specific meaning (excepting the “new” titles being republished in the past few years—obviously not of her choosing). “Daughters of England” … the two women in this book were not royal or noblewomen. Their nationality was never called upon to distinguish them, since they never left England. I cannot think why this book was given the name of Philippa Carr’s entire saga when its contents have nothing to do with the other books. Finally, after realizing this book was published two years after the author’s death, I began to ponder the possibility that perhaps it was left unfinished. I dragged through the last quarter of the book looking for the author’s signature wording and sentence structure. While I couldn’t pinpoint any specific part where the book seemed to veer from the writing style, the ending was very abrupt with 3 years tidied up into two and one half pages. There was no suspense leading up to or genuine closure with the ending. In fact, the supposed antagonist, if you read the jacket synopsis, is not really too bad throughout the story. This, I feel, is another mistake made when presenting the author’s final work to her fans. The history and political intrigue within its pages make this book more than just a story about love and deceit. I strongly feel that the author would have recommended this book to be published under the pseudonym Jean Plaidy and titled differently. However, at the time being, I am at a disadvantage as I have not read any other Carr novels in which to compare with this one. The synopsis and character list for each book is listed here. I’ve been told that they need not be read in order to enjoy them. In conclusion, I can’t say for certain if my theory is true, but offers another tidbit to ponder on the author’s well-guarded personal life. Copyright © 2019 Jean Plaidy / Philippa Carr / Victoria Holt.